Tattoos beautifully age on this area. Forget about placing tiny tattoos on your fingers and wrists. The new "It" place is on the inner part of your elbow or knee called the ditch. No, we're not making things up, it's a legit term of that area. Although it's one of the most painful and difficult places to tattoo on the body, Refinery29 reports that more people are asking for it now. What keeps the demand high is that the area makes a great location to flaunt your new ink, and if it was done by a superb artist, the tattoos on the ditch will ~*beautifully*~ age. Planning to get a tattoo on your ditch? Keep scrolling for some ink inspo! You'll have enough space for that watercolor flower you've always wanted. Or you could have an actual picture turned into a watercolor tattoo! 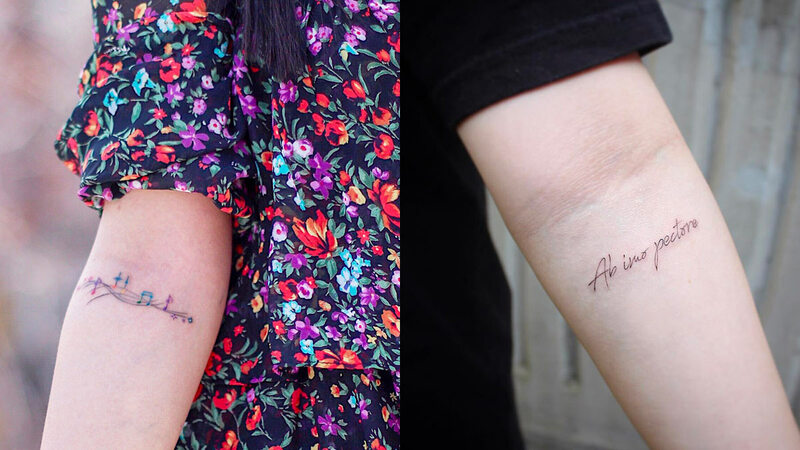 If you're a minimalist gal, you'll love this barely-there tat. Notes + rainbow will perfectly complement your music-loving personality. In case you were wondering if quotes could work as a ditch tattoo, here's proof! Bored of heart tattoos on the wrist or fingers? The ditch is the perfect place. A jewel tattoo will definitely add some ~*sparkle*~ to your life!